These cute panda bear towels are great for your home, whether in your kitchen, bathroom, or laundry area. They are absorbent and perfect for drying dishes and silverware. Give them as a fun, practical gift to your friends, especially someone who is just setting up a new home. 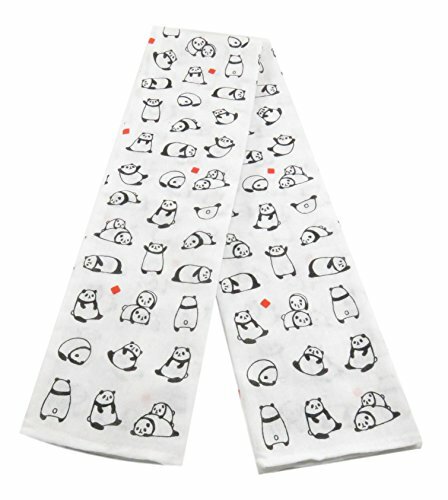 THE SPECIFICS: Set of two 100% cotton panda design towels measuring 34" x 13.75". Wash with cold water and do not tumble dry. The material is lightweight so dries very quickly. VERSATILITY: The towels are fun, absorbent, and perfect to coordinate with other animal themes in the kitchen. MULTI-PURPOSE: Use these as cleaning cloths, too. They also work well to brush away the clutter or crumbs on your counters or cutting board. PRACTICAL GIFT: This unique set of dish towels is a practical gift for your family and friends, especially those who are animal lovers. If you have any questions about this product by Daiso, contact us by completing and submitting the form below. If you are looking for a specif part number, please include it with your message.